Forecasting using a combined warehouse can help you navigate multiple lead times, more efficient ordering, and warehouse transfers. Multiple sales channels, multiple warehouses, multiple headaches. If you’re like many vendors who have more than one sales channel but no good way to manage inventory in multiple warehouses, there is an easy way to do it. Let’s take Cora as an example. She sells merchandise in a Shopify store on her own website, as well as on Fulfillment by Amazon (FBA). Cora has a difficult time managing her inventory in different warehouses, and she wants a way to determine inventory and lead time at a glance. She wants to know the demand for each warehouse so that she has the right products to fulfill requests on her own website. She must also know the demand for her Amazon products to feed that sales velocity and customer demand, which is very different from her Shopify store. In creating a combined warehouse, Cora has the option of picking and choosing what inventory will go into it. She can limit to just Shopify and Amazon, or use them both. Cora’s combined warehouse allows her to know the demand for both Shopify and Amazon. At this point, she needs to consider what stock is tied to each sales channel. If Cora is selling on Amazon FBA and Shopify, then those are different sets of stock to fulfill sales on each channel. In this case, she should view each warehouse individually and order what is forecast to meet demand at each location. Cora uses the same warehouse for her Shopify stock and selling via Amazon FBM. 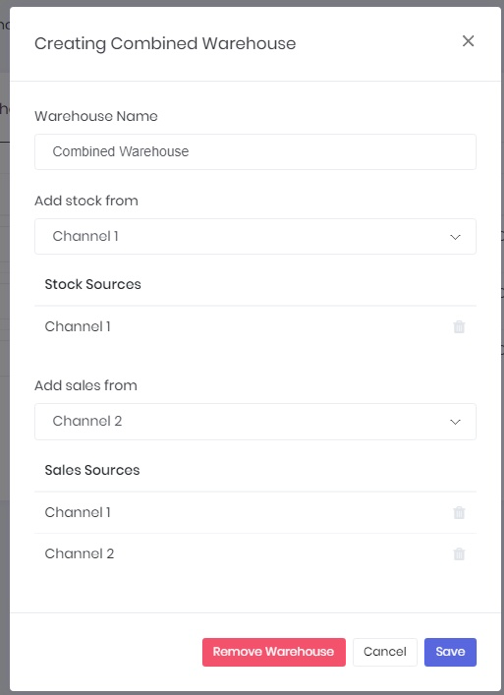 Since she has two sales channels but uses the same warehouse, she will create a combined warehouse using sales information for building a joint forecast, but she will use only stock from one channel. If Cora is fulfilling her stock from the same warehouses, that must be taken into consideration, or else the stock will be double counted. If Cora wants one replenishment order for two sales channels in two warehouses, she will set up a combined warehouse incorporating sales and stock from both sales channels. Cora orders from an oversees supplier and will have the Shopify shipment delivered to one warehouse and part of the order transferred to an FBA warehouse domestically. Because she doesn’t want to pay excessive fees for Amazon’s warehouses, she only keeps a small amount of stock there. If you are a current Inventory Planner merchant, scroll to the end of this article to see how to set up your combined warehouse for these scenarios in your account. Combined, the lead time and days of stock are the total planning period. Cora can set up lead time by warehouse. Her Amazon warehouse can have a different lead time than her Shopify or the combined warehouse. Cora needs to determine the lead time and days of stock for her combined warehouse in order to see an accurate forecast and replenishment recommendations. Cora’s lead time for her combined warehouse will cover the time it takes from placing a purchase order with her supplier to receiving that shipment. If she needs to send part of that shipment from one warehouse to another, she should set the lead time for the destination warehouse as the time it will take to transfer the shipment. 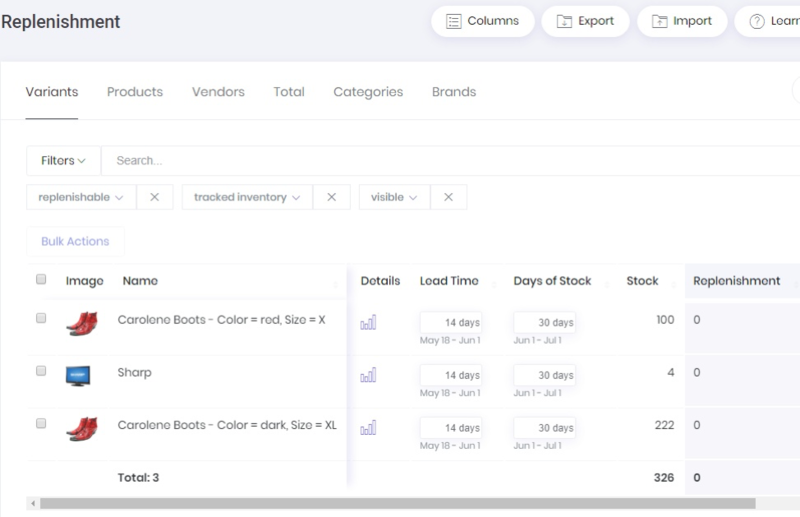 Before using replenishment recommendations product lead times and days of stock should be configured. For this example, Inventory Planner recommends that Cora purchase 36 units of the Mango dress that will arrive in 14 days if she places her purchase order today and will cover the following 30 days. When in doubt, Cora should add additional days in the lead time period. Read why we recommend increasing days of stock rather than using safety stock. Days of stock can be seen as the frequency of purchasing. If Cora purchased her stock for 90 days, she should place her next purchase order for this supplier in 90 days, assuming that projected sales are correct. When lead time is less than the cover, Cora doesn’t have to take immediate actions once her stock is arrived. For example, if she received products for the following 90 days and the lead time is 30 days, she has 60 days to do something else. In this case right after receiving products from a supplier. Cora should review her stock place another purchase order. This makes sense to use when Cora’s lead time is very long (longer than 90 days) and she doesn't want to keep that much stock. In this case, she will always have multiple pending deliveries from each supplier. Cora wants to avoid Amazon’s long-term storage fees as much as possible, stay flexible, and send smaller amount of merchandise to Amazon. Therefore, her lead time at her FBA warehouse is only going to be seven days. Cora prefers to keep all but a seven-day Amazon supply at her Shopify warehouse, so she frequently checks her combined warehouses in Inventory Planner. Because the lead time for Amazon is so short, she uses the combined warehouse to gauge when she needs to place an order with her supplier. Since Cora is selling on both Shopify and Amazon, her combined warehouse must have a lead time that covers the full ordering cycle in getting merchandise to Amazon. Her supplier creates the order, ships it, sends it to her local (Shopify) warehouse, then she creates shipment plans to Amazon in smaller amounts. Cora could wait as long as 90 days from the time she places the order with her Chinese manufacturer to the time it reaches her combined warehouse. Another factor to consider is how long it takes to ship merchandise from the Shopify to the FBA warehouse. Does Cora need to allow for extra time to ship from one domestic warehouse to another, or would it be more efficient to have the FBA merchandise ship directly from China? 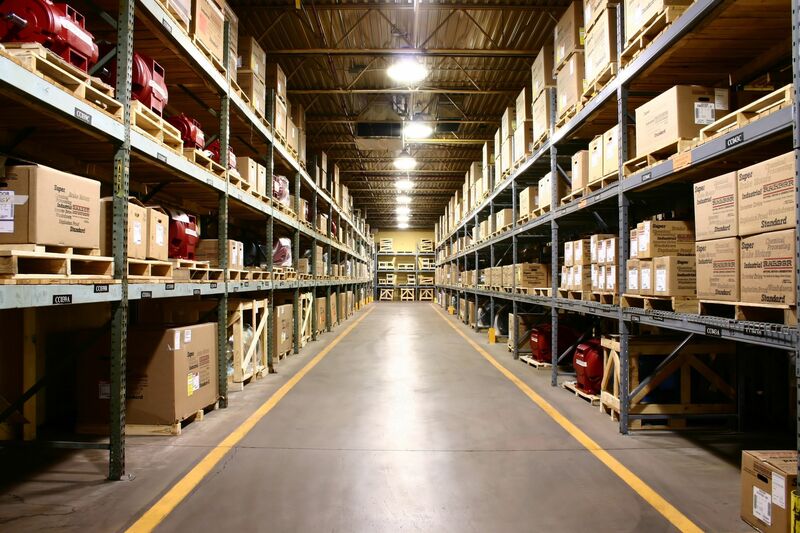 There are many factors to consider when determining replenishment and lead time: number of warehouses, time it take to receive from the manufacturer, sales velocity, and days of stock. However, managing multiple warehouses and multiple sales channels doesn’t have to be a hassle. Creating a combined warehouse can help you navigate the lead time gamut from a 90-day wait from a Chinese supplier to a seven-day shipment from a Shopify warehouse to the Amazon warehouse. The data you use for reports must be accurate to predict sales velocity. Checks your connections to ensure that the correct data is being pulled into Inventory Planner in order to have the most accurate reports. Click on Account > Settings to see which sales channels are connected. Here there are three three sales connections. Next, check Warehouses to see which are enabled and active. Single warehouses will appear when you originally connect with Inventory Planner. Any warehouse on your platform will show in Inventory Planner. Since there is more than one sales channel, you will need to connect them to Inventory Planner account. However, if you do not have FBM and doesn’t want it on your reports, simply disable FBM by deselecting the Enabled checkbox. Click Save on these settings. As an example, you have two warehouses in the United States, but order everything from a supplier in China. You want the ability to order everything you need for both warehouses and both sales channels in the United States at once from the Chinese manufacturer. It doesn’t make sense to place separate orders for both Shopify and Amazon, because she would have to pay for two separate different shipments from China to the United States. If you sell products via FBA in addition to your own site, you need to set up a combined warehouse for placing orders to meet demand across all stores and locations. 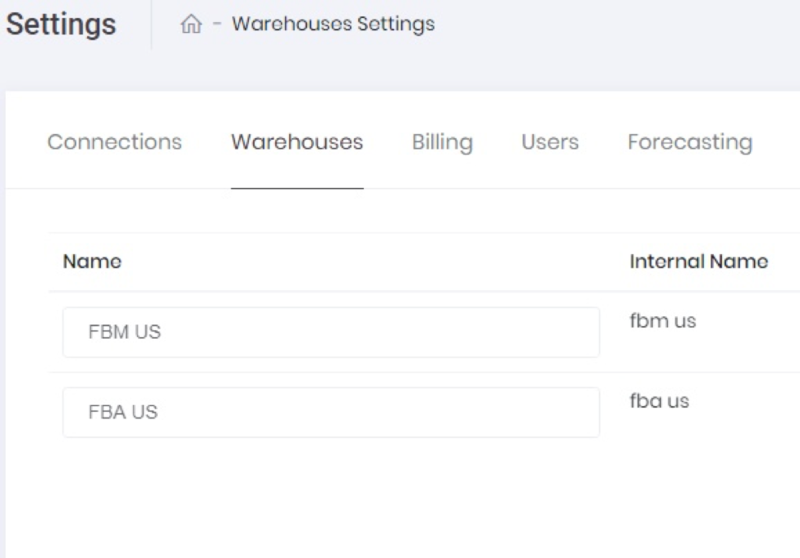 In the warehouse settings view, you can connect additional sales channels, and also have just one combined view without any warehouse details. By clicking on Enable in the far right column, you can see all the details. This will allow you to see what is happening on Shopify, everything in Amazon, or both sales channels combined. First, click Create Combined Warehouse. Then enter the combined warehouse name. 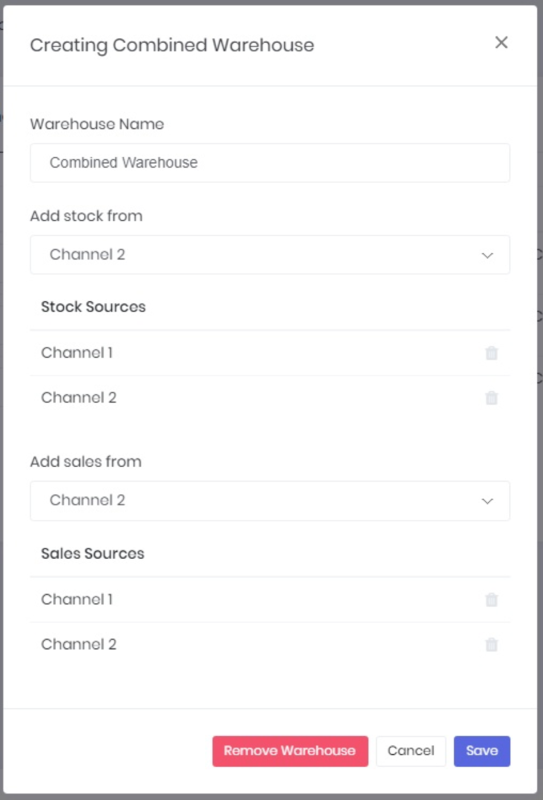 Next click Add stock from one sales channel and Add sales from both channels that will fulfill from that warehouse. Then click Save, and review the Combined Warehouse to ensure you have stock from one sales channel and sales from two sales channels. Combined warehouse set-up: Deliver full order to one warehouse, then transfer a portion of the order to another warehouse domestically. Name your combined warehouse.Then click Add stock from both sales channels and Add sales from both sales channels. After you save your new combined warehouse, verify that you are pulling stock and sales information from both sales channels.